In the LINK-GIS Map Viewer, zoom to the desired area on the map. By default, the zoning layers are turned on when the map viewer is open, however they do not show up until the map scale is zoomed in to 1:6,000 or closer in. When the zoning layers are on, the zoning boundary lines and zoning labels will be visible. Click on the zone of interest to open the pop up window. The pop up window should show the zoning information. If the pop up window shows parcel information or something else, simply click the white arrows on the top of the pop up window until the zoning information is shown. 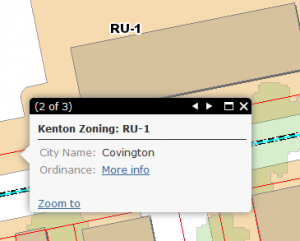 For Kenton County only, there is a link to the Zoning Ordinance information. Click on the link to open the Zoning Ordinance pdf from the PDS website. * Please Note: the Pop-up Blocker will need to be turned off to view the linked website. To close the pop up window, click the ‘x’ in the top right corner.